I'm running True Image 2017 on 4 separate Windows 10 PCs. One is on the standard Creators Update, two are on the Insider Preview Fast Ring (16288) and one is on the Fast Ring Skip Ahead (16362). It is this last one that I've just started having problems with. After running my PC for about 5-10 minutes, it just shuts off, with no warning. I can't see anything in the Event Log. If I run Task Manager before, I can see that Acronis True Image starts and runs for a couple of minutes before the crash. I had been running this build without problems for a few days. However I only got this problem last night, when my scheduled backup was due to take place. I will try to disable the backup and see if that stops the crash. David, I have not seen any recent reports of significant problems being caused by these latest Insiders builds - just one for 16362 that I can recall. I am running ATIH 2018 & 2017 on Insiders 16288 with no problem on two separate computers but have never been on the Fast Ring Skip Ahead path, which I believe is now closed to new users. At least when I tried to enable it, I was given a message to that effect. I can only recommend opening a Support Case direct with Acronis for this, as this should equate to the changes to be introduced with the Fall Creator's Update 1708? due next month, so I would hope that development have had some systems testing this too. Note: previous issues with Insiders builds tend to have been resolved by the next build rather than by any action on Acronis' part. The Skip Ahead branch will be for the first release of Windows 10 in 2018, not the Fall release. The 1708 release doesn't appear to be affected. I ended up having to restore back to a previous Windows 10 build following other issues, and then put my updates on a 1 week freeze. This took me up to the release of build 17004 earlier this week. This has been more stable, but still has a GSOD with Acronis True Image 2107 when it started its weekly backup this evening. Removing the backup via the Acronis UI stops the crashes, so I'm pretty sure it is related to Acronis. The Fall Creators Update will be released soon, so after that all Fast Ring PCs will be on the same build. I'll move one of my PCs on the Slow ring and keep one on the Fast ring. The hopefully I can see if it is just one bad PC, or potentially more widespread. David, I haven't seen issues with my computer on the Fast Ring but that is not a part of the Skip Ahead process, so not seeing the same updates as you. As said before, hopefully Acronis development are also testing against these new Win 10 update versions in preparation for their release to the general public later. Please open a support ticket for these issues with Acronis if not already done so. Once, upgraded to Build 17017.1000 , I check the settings and Audio. I turn off Fast Startup. Then I restart the operating system and go into Safe Mode to check the function of Safe Mode and remove Windows.old, using Disk Cleanup in Safe Mode. When finished, I schedule a Disk Check then restart the computer going back into Normal Mode. Use both Glary Utilities and CCleaner Free to further clean the operating system. Then I use Windows Firewall to Lock down the computer. Then open Acronis True Image 2017 Build 8058 to make an image of the operating system's partition. Normally the process works fine, but fails in this latest Build. The crash seems to related to programs that use win32kbase.sys for a period of time. I am experiencing the same problem as noted above. Maybe the next Windows 10 build will correct this problem. Products: Acronis True Image 2018. I am getting the same symptoms with Fall Creators Build 17017. Previous Build 16299 works fine. Although the Green Screens specify win32kbase.sys as the culprit, it also sometimes indicts snapman.sys from Acronis. Bug check description: This indicates that a driver has been incorrectly ported to the terminal server. A third party driver was identified as the probable root cause of this system error. It is suggested you look for an update for the following driver: snapman.sys (Acronis Snapshot API, Acronis International GmbH). But when I try a system backup it fails with the same green screen then does a restart. I made sure all the various Acronis services were started before starting this last try. Russell, Please open a support ticket for these issues with Acronis if you have not already done so. Russell, please try to raise your support ticket again in case you hit a temporary issue with either your connection or the Acronis web site. I raised one last week myself with no problems. Russell, after filling in the form as shown in your screen shot, can you scroll further down to where it shows fields for your email address and telephone number, then below that your country and finally, a button showing NEXT which when you click submits the ticket. I have just done this myself based on this forum topic with a copy of the topic pages, so hope they don't ask me for more information as I don't have a system with 17017 yet so haven't seen this actual problem myself! Ticket number 03161339 opened based on this forum topic..! You have missed a few Insider Builds. The latest version 17017.1000 crashes when attempting to do a Partition Image, so I restored back to 16299.15. Build 16299.15 is finished installing. Acronis failure gives NO ERRORS, just failure to Install. and this has been an issue on every version of Insider. For me, Acronis True Image is already installed in the Build. It can't be installed when you are using Safe Mode. I always install Acronis True Image in Normal Mode. Works all the time, unless the User Account is corrupt. Had it happen one time and simply created a new User Account. I don't play around. @thecreator I found the reason for the missed Insider builds - on my Insiders settings page I had a message informing me that these were being blocked by my Organisation Group Policy settings despite being a home user, no organisation etc! @snuffy smith, welcome to these User Forums. Please open a New Topic if you still cannot install ATI 2018 when not in Safe Mode, as that is a different issue to this topic thread. Further update: after installing Windows 10 Insiders 17017 then I see the same issue with crashes when attempting to perform a disk & partitions backup. It needs to be noted that this happens for both ATI 2018 and also for Macrium Reflect, neither application is able to make a disk backup without encountering a Windows crash! Hi I have the same problem with Acronis Backup 11.7 on Windows insider build 17025. Yes, just upgraded to Build 17025 on my 32-Bit version and it crashed again when attempting to back up the partition. It would be nice, if the Green Screen included the operating system information and Bit. Above shortcuts to Feedback Hub Feedback. I too have this issue on 64 bit build 17025. The issue occurred on both True Image 2017 and 2018. Raised issue with both Acronis Microsoft via the feedback hub. Please see post: https://forum.acronis.com/comment/428848#comment-428848 for an official statement from Acronis advising that there is no support for any Insiders / Beta version of Windows! I've the same Problem with 17025. Now I did switch to O&O Diskimage which is working without problems. Thanks. I knew that Build 17035 was out, today, but did not install it, yet. I have the same problem. The WhoCrashed tool shows the following. I filed a support ticket. In order to stop the crashes to let you upgrade to 17035.1000, you need to delete the Backup job in Acronis True Image. I didn't need to delete any of my backup tasks when updating Windows to build 17035 and all was fine after doing the upgrade though I did reselect the source & destination for my backups just for the sake of ensuring there was no issues due to any new Recovery partitions being created. @ martin stein , computer had crashed. When you restart the computer from the crash involving Acronis, the Acronis programs will start trying to complete the Backup Task within a few minutes of reaching the Desktop, I learned from the crashes. That's why, it would crash repeatedly, until I deleted the Backup Job, I had created to back up the New Build. By the way, it takes me about 10 minutes to restore a partition using Windows, as oppose to using the Bootable Rescue CD. Morton, thanks for the clarification - I was fortunate that any BSOD's I hit with the earlier Insiders builds didn't give me the scenario you described as I have always disabled the task Error Handling options to prevent any runaway retries etc. Same issue here on 17025; Fortunately I too do manual recoveries if there is a failure so I didn't get stuck in the reboot loop. I pretty reliably see "TERMINAL_SERVER_DRIVER_MADE_INCORRECT_MEMORY_REFERENCE". I opened an Acronis case. Did you not read that Insider Preview Build 17035.1000 has fixed the problem? And Acronis does not support Insider Preview Builds. No Changes are being made. You need to upgrade to Build 17035.1000. 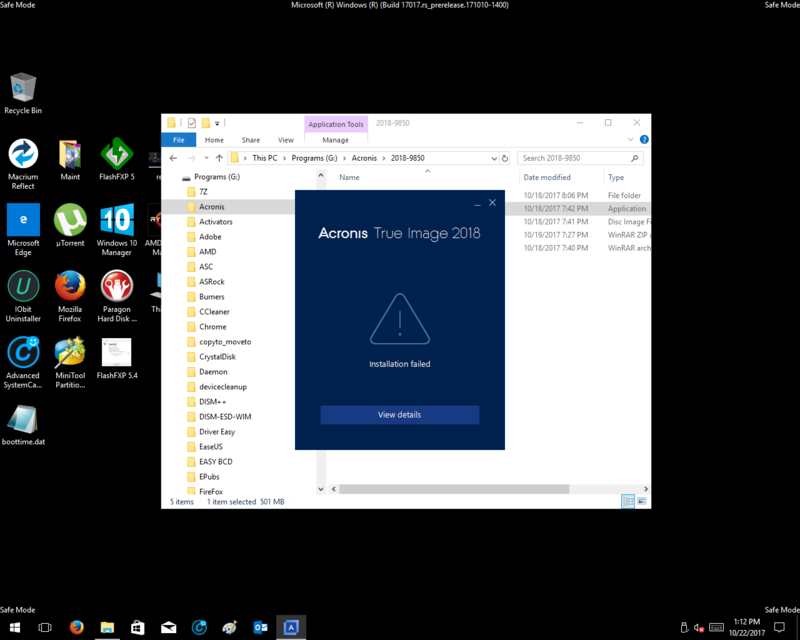 Mark, sorry but Acronis will not deal with any issues arising from Windows Insiders builds as documented in KB 60589: Acronis True Image: Windows Insider Program (beta) builds support. The good news is that the next Insiders build # 17035 looks to have resolved the BSOD/GSOD issues being reported here. The issue seems to have been resolved in the latest fast ring build, however, Acronis support did accept my support request and have been actively investigating (it was escalated twice to a higher level of tech support and then to the devs). I've emailed since to report that the issue is resolved but I would imagine they would be keen to discover this issue in case it's something they have to account for in future builds. I have also had this issue running Build 17025. I will try and update to 17035 to see if this in fact has been resolved. Mark, either 17035 or the latest 17046 builds for Insiders should resolve this issue for you. I have been running on 17046 with no crash issues.